Resource > DVD > How to Create DVD from VHS Tapes? Summary: This article shows you how to convert VHS tapes to DVD. To convert VHS to DVD, you may need a DVD burner like DVDFab DVD Creator. Read on for more detail. It is not so common these days do not know about VHS tapes. Thus, a little information regarding the ancestors of the DVD and Blu-rays is worth mentioning to the new kids on the block. In the 1950s, a series of recording and storage devices were introduced in the market that had magnetic tape wound in the circular fashion to hold videos, audio and general multimedia files that can be played via some mechanical devices called a VCR and so on. They looked something like below. It was an acronym for Video Home System, and was the then standard for consumer-level analog video recording cassettes and became the major contributor to the film industry back then. Since they were almost everywhere these days, still, a lot of households in the US and elsewhere might have boxes full of old VHS tapes. They may have their own home videos, movies from those days and other things. It is useful to convert VHS to DVD to store them in digital format so that their life span can be further increased. The analog tapes might stop working sooner or later, but the digital formats can be stored for a very long time. However, in order to do that one has to identify the best VHS to DVD converter software in the market, as well as the hardware and software necessary to do so. 1. You need to buy or get a VHS player. 2. You need to buy or get a VHS to USB connector. 3. A software to record your desktop while the video is playing and save it somewhere. 4. A software to convert or burn it to a DVD (your laptop/computer must have a DVD player). This is a connector that has two ends, where one connects to the USB of your computer and the other is a composite connector that connects to the back side of the VHS player. The connector supports USB 2.0 while the VHS has RCA connector, which means that the video is played at below 30 MBPS speed only. As long as your VHS player has composite outputs Roxio can carry it to the laptop forward. It also has an inbuilt video or screen recorder software bundled with it. This allows you to record the screen when the video is playing and then render it to a digital video. It has direct options to convert VHS to DVD or to save the file as a video file and you can do anything with it, afterward. This also gives you added advantage with a video editor that will allow you to customize your video, apply effects, transitions, cut away unwanted footage and so on. You could also add audio tracks collected from elsewhere and make it a new video. It has the ability to capture and convert it to DVD directly, and in some tests, it has been found to do it simultaneously, that is, a 40 min video could be stored as a DVD in just 40 min or so. The quality of the created DVD was also found to be among the best in many reviews and user ratings. Another option to get this conversion and DVD creation done is to use an analog-to-digital video converter to convert your VHS tapes to video files first and then burn them to DVDs. This method may take you more time to finish the whole work, but it gives you more flexibility to deal with the videos from VHS tapes. Before burning the videos to a DVD, you are able to edit the videos by using iMovie or Windows Movie Maker (Windows). And then you can burn them to your DVD with a DVD authoring software like DVDFab DVD Creator. DVDFab DVD Creator is an easy-to-use and powerful DVD burning software. With it, you can burn the videos recorded from VHS tapes to DVD discs/folders/ISO files easily and quickly. It uses the latest hardware acceleration technology, so it can burn a DVD at an amazingly fast speed. You do not need to worry about the output video quality, for DVDFab always output DVDs with high quality videos and audios. The DVD maker software also provides many menu templates for you to customize your DVD menu. 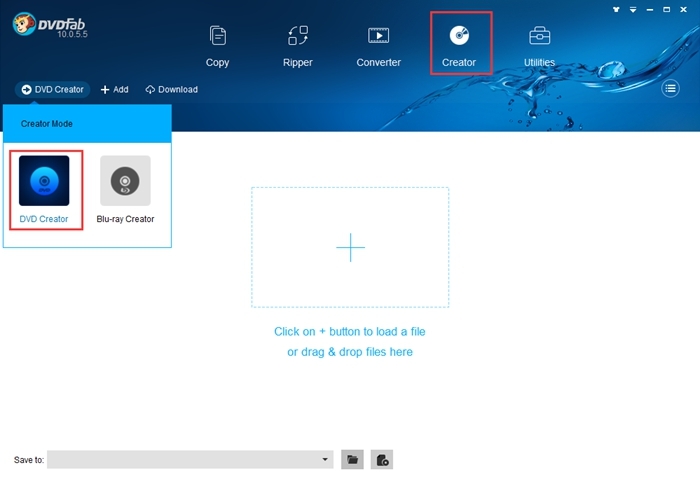 To use this DVD creator, only a few mouse clicks are needed. Step 1: Run DVDFab 10, go to Creator module, and load the video you want to burn. Go the mode switcher on the top left corner to choose the DVD Creator mode. Step 2 (optional): You can choose to add external subtitles and click the “wrench” icon to customize your settings (customize your menu). Step 3: Choose to burn the video to a DVD disc, folder or ISO file. Then click the “Start” button to start the conversion proces. After a few minutes, you can get your DVD and play it on your DVD player. Here we are sharing a list of 10 best 80s movies on Netflix. And we will also show you how to rip Netflix DVDs of 80s movies with the best DVD ripper tool. How to Play DVDs on Xbox One? This article shows you how to play DVDs on Xbox One with the dedicated Blu-ray Player and how to convert DVDs to Xbox One supported videos with DVDFab DVD Ripper. This article tells you how to use the professional ripping tool – DVDFab DVD Ripper to rip and convert DVDs with subtitles to Nexus 9 easily and quickly.